Some 13 of the territory’s athletes were in action over the weekend as the outdoor track and field season began in earnest for several of them at meets in Puerto Rico and across the United States. At Saturday’s University of Central Florida Black and Gold Challenge in Orlando, Florida, Chantel Malone, won the women’s long jump with a leap of 6.38-meters (20’11¼”) on her fourth attempt. 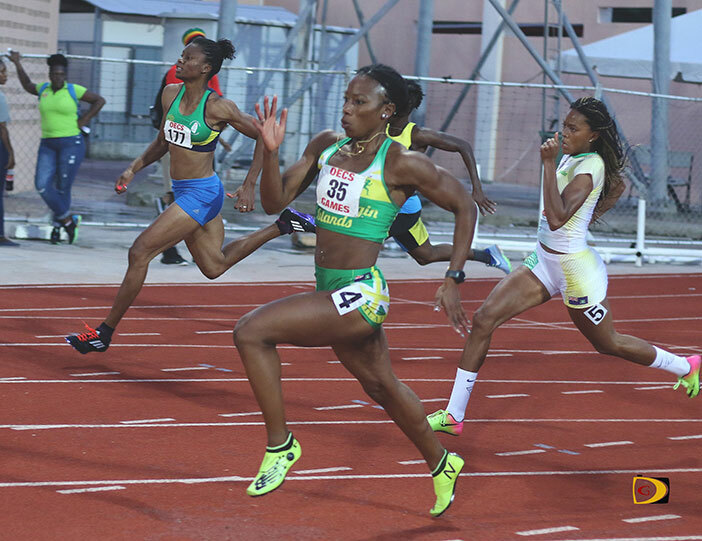 The meet formed part of her tune up for the upcoming Commonwealth Games in Gold Coast, Australia, April 9-14. Sprinter Ashley Kelly who will join Malone in Australia, finished second in her 200m heat and third overall in 23.63 seconds. Kelly had the fastest 400m outdoor debut of her career, when she finished second in 53.37 seconds in her heat, placing third overall. Central Arizona College sophomore Tarique “Tweety” Moses finished fourth in his 200-meters heat in 22.32 seconds, at the Willie Williams Classic in Tucson, Arizona. He ran the third leg on the 4x100m relay that placed eight in 42.87 seconds. Barton County College freshmen Adriano Gumbs, ran a time of 2 minutes 02.36 seconds to finish seventh in his 800-meters debut at the Emporia State Spring Invite, at Emporia, Kan.
At the Costal Carolina Invitational in the Alan Connie Shamrock Invitational in Myrtle Beach, South Carolina, Albany sophomore Jonel Lacey made her 2018 debut in the 400-meters with a time of 59.43 seconds. 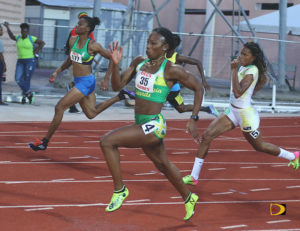 She ran the second leg on the winning 4x400m relay, that recorded a time of 3 minutes, 49.61 seconds. Coming off injuries that hampered her indoor season, Clemson sophomore Lakeisha “Mimi” Warner, competing at the 49er Classic in Charlotte, North Carolina, was seventh in the 400-meters hurdles in one minute, 04.14 seconds. She ran the leg on the 4x400m relay that placed second in 3 minutes 42.93 seconds. ASA Miami college sophomore Ronique Todman, recorded seasons bests marks of 21.99 seconds and 48.64 seconds in the 200 and 400-meters respectively, at the Nova Sharks Invitational in Miramar, Florida. Todman was second overall in both events. He contributed a third leg carry on the winning 4×100-meters relay that recorded a time of 41.06 seconds. At the 13th annual Spring Break Classic in Caguas, Puerto Rico, Turabo University sophomore Deya Erickson ran her first outdoor race since a severe 2016 injury that wiped out her 2017 season. She finished second in the 100m hurdles in 14.71 seconds. Arianna Hayde was 11th overall in the long jump with a wind assisted leap of 5.57-meters (18’3¼”). Rikkoi Brathwaite, in his first outdoor race, finished third his 100-meters heat with a time of 10.81 seconds, to place fourth overall. He was third in his heat and also fourth overall in the 200-meters, with a personal best effort of 21.65 seconds—narrowly missing the BVI Jr. record of 21.63 seconds. Competing in the 67th Texas Southern Relays, Josh Hill ran a personal best of 48.61 seconds in the open 400-meters and finished second overall. His 22.03 seconds in the open 200-meters, was good for third overall, after winning his heat. At the high school level, Timber Creek junior Xiomara “Gia” Malone qualified for the CARIFTA Games U17 Girls Division in a third event, when she cut the sand at 5.27-meters (17’3½”) in the long jump, to win the Highlander Relays in Orlando, Fla. The BVI native cleared the bar at 1.62-meters (5’4”) for the high jump victory. She finished second in the 100m hurdles in 15.62 seconds, then helped the 4x400m relay to victory in 4 minutes, 05.06 seconds. Middle schooler Adaejah Hodge, competing for Legacy Athletic Club, lowered her 200-meters personal best to 26.41 seconds, in winning the 11-12 Girls Division at the Wheeler High School Invitational in Marietta, Georgia. She cleared 1.27-meters (4”2”) to win the high jump and was second in the 400-meters with a time of one minute 04.52 seconds.